Behavior contracts to keep students on track. This daily progress report helps to support appropriate behavior. 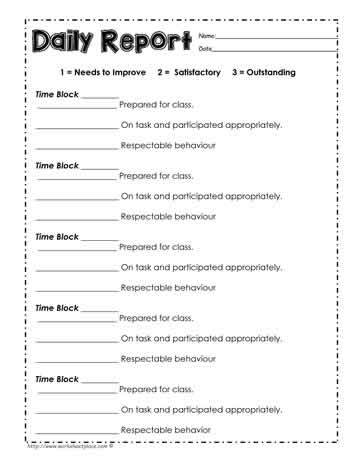 Behavior worksheets and contracts are much more effective when students are held accountabile for each time block. Provide positive reinforcement as the students correct their behavior. The goal of a daily progress report is to correct the inappropiate behaviors. Consistency is key when using this type of report. Parental involvement is also very helpful.